historic registration - Citroen Societe South Australia Inc. - Citroen Societe South Australia Inc.
Members of Citroen Societe South Australia Inc. are fortunate to use the Conditional Registration Scheme for Historic Vehicles, Prescribed Left Hand Drive Vehicles and Street Rod Vehicles. This South Australian scheme enables members of recognised motor vehicle clubs, such as Citroen Societe SA, to register historic vehicles for a reduced annual fee. The Federation of Historic Motoring Clubs SA Inc. is authorised by the Government of South Australia to administer the distribution of registered Log Books under the Conditional Registration Scheme. 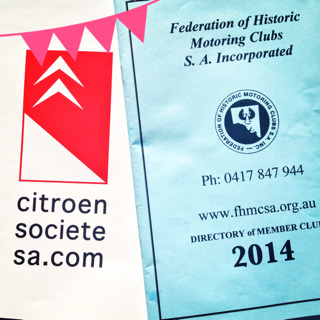 The Federation issues registered Log Books to motor vehicle clubs that have been approved and recognised by the South Australian Registrar of Motor Vehicles, including Citroen Societe South Australia Inc, which became a recognised club on 20 July 2014. Maintaining an approved Log Book is a legal requirement of using the Conditional Registration Scheme. As a member of the Federation of Historic Motoring Clubs SA Inc. Citroen Societe SA is able to purchase Log Books for a reduced fee and associate with more than 120 motor vehicle clubs that are members of the Federation. The Department of Planning, Transport and Infrastructure identifies the Federation of Historic Motoring Clubs SA Inc. as the primary lobby group representing motor vehicle clubs in South Australia. To administer the Conditional Registration Scheme, Citroen Societe South Australia Inc. has two Authorised Persons, Mr Chris Bennet, and Mr Allan A Ward. All vehicles admitted to the Scheme must be inspected by an Authorised Person to assess that a vehicle is eligible. The Authorised Persons refer to the Code of Practice for Historic Vehicles, Prescribed Left Hand Drive Vehicles and Street Rod Vehicles MR332 (effective 1 July 2017) under the Conditional Registration Scheme. If the Authorised Persons require further guidance, assistance is sought from the Federation of Historic Motoring Clubs SA Inc.
To qualify for the Conditional Registration Scheme 30 years must have elapsed since 1 January of the year in which the vehicle was manufactured. 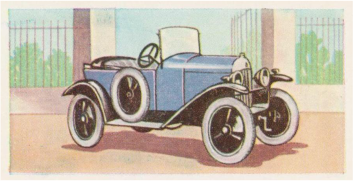 Limited modifications to the vehicle’s original specifications may be permitted, at the discretion of the inspecting officer. In addition, the vehicle must be eligible to be driven on public roads i.e. it must be roadworthy and comply with relevant design rules. The certificate of Registration must be presented to the Club's Authorised Person/s from the Club that initially completed the MR334 form, prior to an approved Log Book being issued. The Authorised Person must record the following details on the back of the Certificate of Registration: the serial number of the Log Book, the date of issue, Club stamp and signature. It is a requirement of the Conditional Registration Scheme that the owner/s of a vehicle must be current financial members of a recognised motor vehicle club such as Citroen Societe South Australia Inc. before a Log Book is issued. A person is not permitted to have Log Book for a vehicle issued by more than one recognised motor vehicle club. Citroen Societe South Australia Inc. issues Log Books for a fee of $5.00 per book which is the recommended retail price suggested by the Federation of Historic Motoring Clubs SA Inc.